I’m grateful and honored to help others find happiness and peace within themselves and in their relationships”. Sharon has extensive experience and training in counseling all age groups. Her calming and heartfelt ability to help individuals, couples, and families overcome challenges is most often appreciated by her clients. Her approach with concerns of depression, anxiety, trauma experiences and relationship problems is one of support, compassion and practical tools for recovery. With more than 40 years of experience in social work, Sharon has helped people from all walks of life discover what is possible in their lives. As a highly professional therapist, Sharon treats her clients with an exceptional level of compassion, respect, and understanding. With a Master’s Degree in Social Work from the University of Minnesota, she has extended her training to include: certification in EMDR (Eye Movement Desensitization and Reprocessing), advanced training in EFT (Emotionally Focused Therapy) and CBT (Cognitive Behavioral Therapy) and Biofeedback. Sharon is exceptionally trained to meet the needs of her clients. 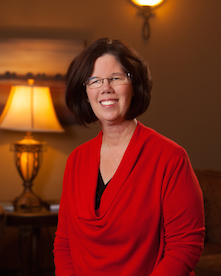 Sharon has owned and been the clinical director of Pinnacle Counseling for 10 years and is very appreciative of her clients – most of whom are connected with the Northwest Arkansas retail and supplier community, education system and medical services. Sharon and her husband Gary have two adult children and four grandchildren. Her personal hobbies include oil / acrylic painting, long walks in nature, and time enjoying family.